When we chose the ingredient for this edition of Weekend Wokking, we wanted something that would be extremely versatile. I think we achieved that goal with the ALMOND. It can be sweet; it can be savory. It can come whole, ground, or in slivers. It can be roasted golden and nutty; it can be blanched smooth and mild. It can even be ground into almond meal! We knew we definitely wanted to take advantage of all its qualities. 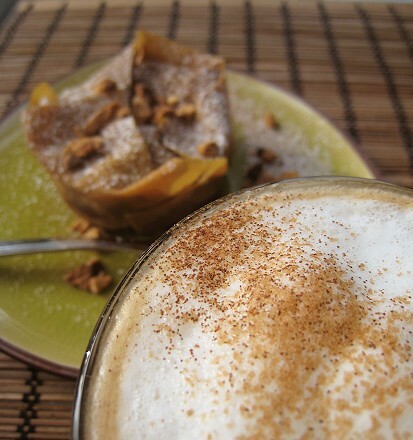 Why don't we have a nice latte and think about what to make? 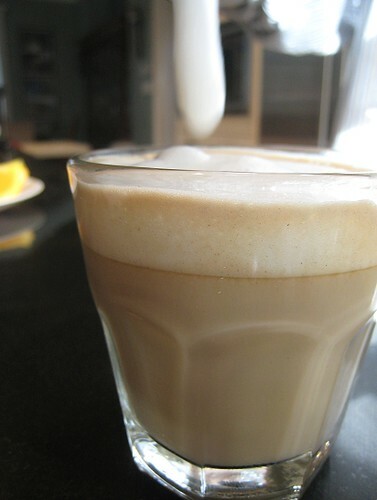 Here's your shot of espresso and some steamed, foamy milk. Wait, was that plain ol' milk in your latte? No, it's almond milk! Ever since I saw Tony Tahhan's sharab al loz post on his blog Olive Juice, I was very intrigued. See, I love almonds. But almond milk, not so much. The almond milk I know is basically milk combined with almond extract. I detest the taste of almond extract! Vile, very vile. Sharab al loz, though, is made with real almonds. I must try it, I vowed. And now I have! 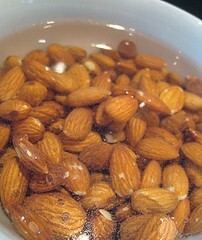 There is no instant gratification as the raw almonds need to be soaked in water overnight. The next day, they are boiled in water for about 30 minutes. Look how plump they get! Then, it's a matter of. Peeling. Each. Individual. Nut. By hand. Not to worry, we're almost done. It's just a matter of adding the peeled almonds into the blender, and blending them with some milk and sugar (don't make it too sweet). I used 2% milk because that's what we had. Ta-da! The mixture is a thick liquid meant to be used as a concentrate. 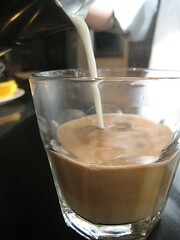 To make your drink, simple add some of this concentrate to more milk and/or ice. 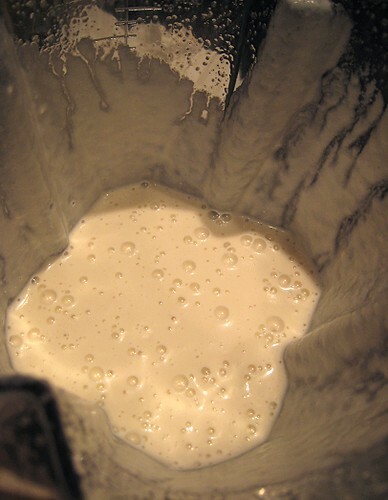 Stir or process in a blender. For my latte, I added this almond milk concentrate to more milk and steamed away. 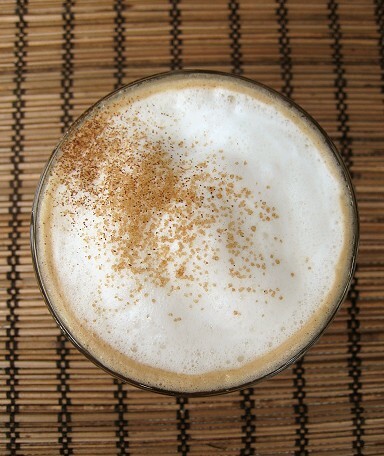 Then, I finished my drink with some cinnamon sugar. 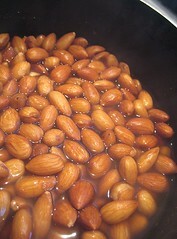 A note: there will be some sediment from the ground almonds, so you may want to strain the mixture through a fine sieve. So, now that we have enjoyed our little drink, have we decided on what to make for Weekend Wokking, Almond edition? What is that blurry item in the background? If you'd like to participate, see who's hosting next week. WHB is hosted this week by of Laurie of Mediterranean Cooking in Alaska. I love coming here. You guys are always so adventurous. I would never have thought to make my own almond milk. Well done! Almond milk was actually very popular in the Middle Ages and has gone out of style. Bring it back. The real thing is awesome. I can't wait to try to make my own. Funny! I was thinking of almond milk when you chose that as the secret ingredient. Some kind of almond pastry? I'll take both please. I made something with almond butter. I *love* that you made the milk from scratch!! If you should happen to come to Boston, remind me you don't like almond extract... I use so much of it! Seriously, though, this looks wonderful. Almonds make everything taste better! 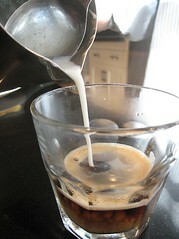 I'll have to try this the next time Spouse dusts off the espresso machine. technically, this should be almond juice and not milk, because milk comes from a mammal, doesn't it?? hmmmnnnnn. just thinking out loud :o) haven't tried almond milk before.. interesting..
OMG! So much work in making almond milk from those raw almonds! Salute you! What a way to take your latte up a notch! I actually just bought my first bottle of almond milk - it's quite tasty! I'm not entirely sure I'd want to make my own, but as always you two go the extra mile! Isn't if fun to peel almonds? I just did a pound of them. You think the concentrate can be frozen? Almond milk! What a great idea... it sounds delicious! this is great! i use soy for my latte... i wonder how almond milk will taste like... how you tried "pure" almond milk (no sugar/no dairy)? I make almond milk, and use it in smoothies. OMG it is the most beautiful thing. 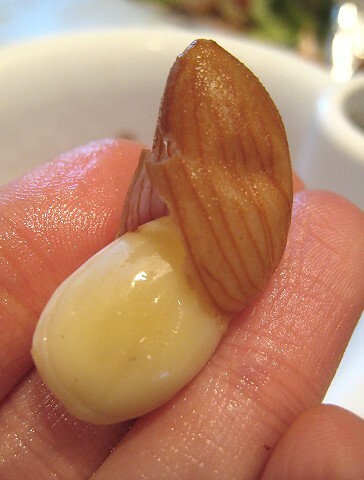 I soak the almonds but dont bother to boil or peel. Straight into the blender with water. Then I strain through muslin. And voila! thick creamy almond milk. 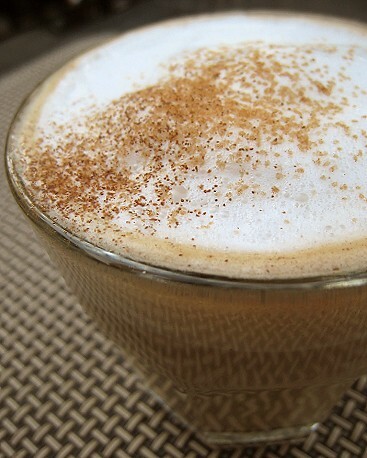 I love the look of the latte with almond milk. A great photo. oh, I wanted to add that even tho the almonds are not peeled, the milk is still very white. It is worth trying, I think. Don't know how often that'll happen, though! Unfortunately, the coffee drinker in the house (JS) takes her coffee black. =) Maybe I'll try a mocha. Oooh. Oh, I haven't seen them for sale. I'll keep my eyes peeled. Is that sarcasm? =) I don't know, re concentrate, because it has milk. The texture may not come out nicely once thawed. When I set out to make this, I actually didn't realize that it would still contain milk! I guess "pure" almond milk would be the same technique as making coconut "milk" and soy "milk", eh? Hmm... I do wonder how that'll taste! Oh, cool. So no peeling required, and the peels get strained out. Good tip! And you also make it "oure" without added dairy! Ok, will have to try it this way next time. Thanks!